I wrote the article below for DiaperSwappers.com where I also blog at. While I’m not really supposed to double post, I wanted to get some input on your thoughts about this article before I post it over at Diaper Swappers. The reason is that I want to make sure I articulated myself well enough to not offend everyone and that I’m not creating more problems than I’m solving. Please leave me your thoughts as a comment below–should I post this article over at Diaper Swappers, or not? I began my mothering career by being at home full time for the first six weeks of my daughter’s life. Six weeks and five days after her birth, I returned to my full time weekday and part time Saturday job with breast pump and tissues in tow. I continued this journey for the next 17 months until I was pregnant with my second child and taken off of work at 32 weeks gestation due to pregnancy complications. 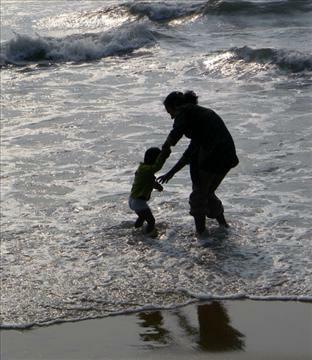 My daughter was 18-months-old at that time and I felt as though I had missed all of her infancy. We spent the next 8 weeks cuddling and playing to make up for the time spent apart, finally with me as a stay-at-home-mom (SAHM). After my son was born, I began working part time when he was five-weeks-old. With two babies in tow, I am ever so thankful that my husband was able to finally find a job after a two year search. While I still have to work to make ends meet, I am now a work-out-of-home-mom (WOHM) two days a week, a work-at-home-mom (WAHM) one day a week, and a SAHM for the other four days. Having experienced all of these different mothering styles has allowed me some insight into the challenges and rewards of each one, and I can now say that I think the enjoyment and difficulty level of each one just depends on the mother and the circumstances surrounding why she is one of these three things. When I was a WOHM, I would often receive snide comments from sometimes well meaning and sometimes not so well meaning individuals. They were from all three types of mothers—not just from SAHM’s which many people assumed. The interesting thing, though, is that as a SAHM and now part time WOHM, I’m still receiving comments—they’re just of a different sort! It seems as though the dreaded “mommy wars” hound mothers for their titles of WOHM/SAHM/WAHM. It’s too bad, because being a mother is hard enough without being judged and criticized for your work status. Here’s a secret that a lot of moms seem to forget: we don’t all like the status we’re currently in. I despised being a full time WOHM and I still hold true to that even after being a full time SAHM (contrary to the ever popular “so do you still want to be home?” question I’m asked after experiencing the life of a SAHM…like I’m supposed to start dreading it after two weeks or something)! However, I know women who hate being SAHM’s and prefer to work away from the home. And guess what: it’s okay to be different. A woman’s work status doesn’t determine her intelligence level, talent, or capabilities. It shouldn’t determine her character, either, so let’s stop warring over the great WOHM vs. SAHM debate. Instead, next time we’re about to say something or be offended by something someone else said, let’s remember that we’re all different. Sometimes, a mama just needs to vent. It isn’t a jab at someone else for the SAHM to say that she’s ready to ship her kids to Taiwan or for the WOHM to say that she would be fine if the only people she ever spoke to again were her kids. Sometimes, a mama just needs encouragement, and sometimes, a mama just needs to know that it’s okay to dislike, or even to like, her status. So the next time you’re about to be offended by something someone said, or when you’re about to say something in regards to working in the home, at home, or away from home, stop and remember. Remember that what makes us mothers isn’t our work statuses. It is the fact that we love our children, want what’s best for them, and are going to do whatever we have to do to make that happen. Love, not work, is what makes the world go ’round. FREE week of music lessons from School of Rock! Some women want to be at home full time, some don't. I read an article recently where it said that the majority of women work part time after they become mothers. I tried doing some of my work at home, I never got anything done. For me the best thing is to do that sort of work in my office, whether the baby comes with me to work or not. I love my on-the-road days, because I finally get a chance to catch up on reading and thank you notes and other things. My days at home are spent fully with the baby, interacting and playing. I don't do errands usually, I'm not worried about cleaning unless he's napping, it can be constant one on one attention. Of course, it also helps to have a husband who not only makes a great living, but who helps around the house a great deal, meaning that not only can I limit my work hours to about 30 a week but also have my days off free to focus on the baby. It's the best of both worlds for our family. But I know some women who love being stay at home moms, and I think that's exactly what they should do. And I know some moms who work fifty hours a week, and love it, and it works great for their family–so I think that is what they should do. It's such a mistake to judge another family when what works best for us may not work for them. But what your article didn't touch on, and I can't stand, is the stay at home moms who are really anything but. The ones who aren't really interacting with their children, but putting them in front of the television, or letting them play constantly on their own, or are so busy going to moms groups and other things that they have very little one on one time with their children. Frankly, those kids would be far better off in a high quality day care, and study after study has said the same thing. Amother thing is that being a work out of the home mom is lonely, at least in our area. Momss groups, which there aren't any around(MOPS groups are too far away, I won't drive twenty miles for something like that) are during the day, as is storytime, mommy and me classes, swim classes, etc. are all during the day in our area. You don't really make friends at work, especially when you're the boss! And I have yet to meet any other moms of small children at work, either, so I'm left not meeting any. But the important things, that my son is happy, healthy, and developmentally on target, are met, so that is all that matters. Sara, you brought up an interesting quandary regarding SAHM's who spend their time doing things having nothing to do with their children, homes, or earning money! This in itself could be an entire post, and I'm not sure I'm bold enough to tackle the subject. 🙂 What does everyone think? Write about it, or not? I think it should be a seperate post. I've been thinking about writing about it on my blog so I can give it the breadth it needs. I have the same issue with homeschoolers. I am thrilled that I have the opportunity to homeschool my children, at least in the younger years. But I have seen so many homeschoolers who go on and on about how great they are, but you know they are doing everything BUT school at home. It's the same, sadly, with some SAHM's. Instead of giving their children the time, stimulation and interaction that young children need, they are too busy doing everything BUT being home with their children. Just because you are in the same room or building as your child does NOT mean you are doing them any good. Not that there isn't room for all the “good” activities–moms need time out and some hobbies too. But when those “good” activities and hobbies, and especially television and internet, are all you do, I really wonder if the mom is home because she wants to teach and guide her children herself, or because she doesn't want the hassle of juggling a career and a family. Opening a new can of worms…..I read blogs and many mention thatt their child is playing a video game so they can spend their time on the computer. Unfortunately, this is not ideal for the child and again – what is the point of staying home?!?! This is exactly why I stopped my blog…it took up too much time. Don't get me wrong…I loved it and really liked to get things in my mailbox, but not at the cost of Tate time. Back to your original piece…very well written!! I think you have covered all sides and I don't feel it offensive at all. I thought your article was VERY well written and strikingly uninflamatory! i'd say post away! (i'm a long time SAHM for what it's worth, having experienced both WOHM and WAHM too but mostly a SAHM) Really, i think its stellar and covers all issues well! 2. You never really KNOW the heart and life of another person. really.